Metallurgical microscopes provide high magnification and resolution for samples that do not allow light to pass through them. Metallurgical microscopes are sometimes referred to as materials microscopes and are available as an upright metallurgical microscope (shown above), as an inverted metallurgical microscope (image at right), or on a boom stand for viewing extra large samples. Upright metallurgical microscopes are used to view samples that will fit on the microscope stage. An inverted metallurgical microscope would be used to view larger parts, as the objective lenses are located beneath the stage and allow for placing heavy mechanical parts directly on the stage above the objectives. A boom stand metallurgical microscope is used with a bit more working distance is required than what an upright metallurgical microscope provides. Metallurgical microscopes may look similar to compound biological microscopes, but they differ in a number of ways. Using a metallurgical microscope allows the user to view samples at high magnification (up to 500x and 1000x), without any light passing through the sample the way a biological sample is viewed. 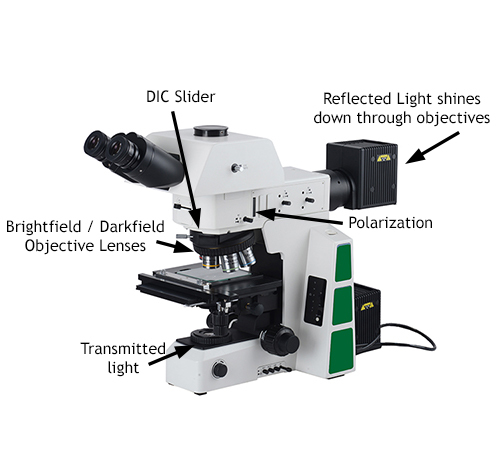 Stereo microscopes are another option when reflected illumination is required, however metallurgical microscopes provide a much higher resolution (and magnification) than a stereo microscope would provide. 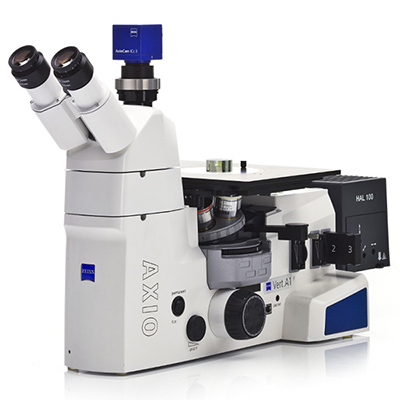 What are some Features of a Metallurgical Microscope? Some of the types of samples you might look at with a metallurgical microscope include metal parts, fiberglass, industrial manufacturing failures in materials, carbon fiber, plastics and concrete. You will run into several types of metallurgical microscopes. The first variation will be with illumination - does the metallurgical microscope have reflected illumination only, or does it also have reflected and transmitted illumination? Will you need to view particles that do allow light to pass through them? If so you will probably want both reflected and transmitted illumination. The next variation will be in the types of objective lenses. Some metallurgical microscopes are created only for brightfield microscopy, while others also allow for darkfield microscopy. Think also about the types of samples you need to place on the microscope. Are they rather small in size and fit in the palm of your hand? 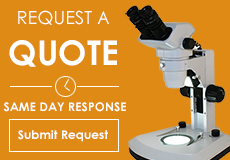 If so, then an upright metallurigcal microscope will fit your needs. If you need to look at large car parts or another type of large sample, an inverted metallurgical microscope will work better for you. 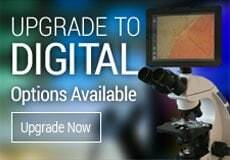 Contact Microscope World with any questions regarding what type of metallurgical microscope is best for your application.